Uncle Henry’s luck began before he was born. His parents immigrated from Germany when his mother was pregnant with Henry. She survived the voyage and Henry was born aboard ship just before reaching the harbor in Charleston, South Carolina, on 2 November 1842. Heinrich Harn Severs (1818-1878) and Mette Marie Bruns (1815-1875) started their life in America with Henry’s birth, followed by four more children born in Charleston before moving to Charlotte, North Carolina, around 1850 (after daughter Mary’s birth). Two more children were born in Charlotte. On arriving in Charlotte, Heinrich Severs purchased land on the western outskirts of the town where he built his home and later added a mercantile establishment. He conducted business there until his death. Henry’s luck was still holding—he survived the Civil War. After the war Henry returned to Charlotte. He married my great-grandaunt Mary Roxanna Primm on 27 June 1865. Henry purchased part of his father’s estate and built a home of his own. Henry and Mary had ten children; six were still living in 1900. Henry followed in his father’s footsteps and worked in the mercantile business, building a store on his property. However, his main business was in land and homes, where he invested heavily, and with the growth on Charlotte’s west side, the resulting area was called Seversville. (He never found out that his wife’s grand niece, Myrtle Primm, would marry into a family, Rohleder, that bought one of his houses.) Henry was well-known in the city, serving for some years as tax assessor of Seversville, a magistrate for Charlotte, and was reported to know the value of every piece of property in Charlotte. Devoted to the memory of the old South, especially the Confederate soldiers, Henry attended Veterans reunions. He also visited the old battlegrounds where he had fought. He loved old things and antiquities, anything that would remind the current generation of their forefathers. In that vein, he established a museum in his home, even erecting a building on his property to house his collection of relics and antiquities, supposedly the largest in the South. Some of the most notable features was the collection of Confederate currency, old coins from around the world, and firearms. He had a collection of Native American relics, women’s wear, household items, and mineral specimens. Towards the end of 1915, Henry’s luck began to run out. In September, his eldest daughter, Cora died from pellagra (niacin deficiency). She was survived by her husband and five children, four of whom were minors. On November 24th, Henry set out on a train trip to Richmond with a contingent of fellow Charlotteans for the annual Thanksgiving game between the University of North Carolina and the University of Virginia. While the “football special” was stopped awaiting signals in Salisbury, North Carolina, another train rear-ended it, killing two, including Henry, and injuring nearly two dozen others. Henry did not leave a will. A newspaper account estimated his estate to be worth between “$40,000 and $45,000, exclusive of the valuable museum” of relics and antiquities. Henry’s wife, Mary, requested that her sons act as administrators of the estate. The 130-plus page probate file indicates that Henry was in debt and the heirs had to sell off some of the property to pay it. The “valuable museum” was taken over by his son, H. Fred Severs. What was left of the estate was divided among Henry’s six surviving children, or in the case of Cora, her children. Mary received her dower and the kids each got one-sixth of the estate; Cora’s share was divided among her five children, each receiving one-thirtieth of the estate. Henry’s daughter Mamie died in July 1924, leaving six surviving children, so her share was divided among them. The estate was finally settled in May 1925. Mary died in December 1926. Henry’s Woodmen of the World tombstone at Elmwood Cemetery in Charlotte, NC. But all is not lost in the luck department. Henry had life insurance through Woodmen of the World. As one of the benefits, the company provided their customers with tombstones, usually in the shape of a log, cut tree, or something similar. 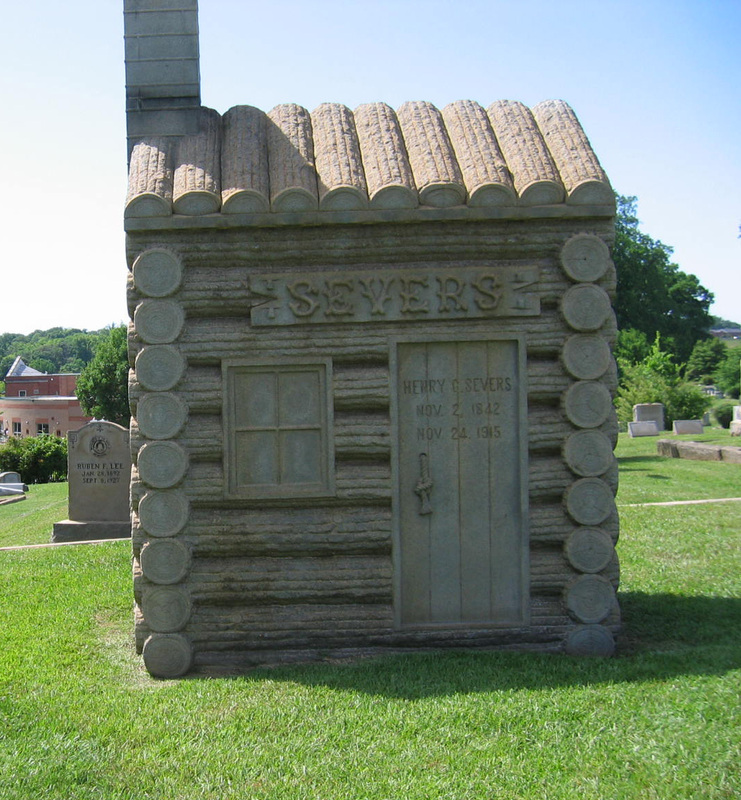 Henry got an entire log cabin for his tombstone. It’s carved entirely from a 15-ton piece of granite, with the exception of the chimney above the roof, and stands about eight feet high at the roof line, eight feet wide and four feet deep. Henry is buried in Section W of Elmwood Cemetery in Charlotte, and it’s hard to miss the grave site. This entry was posted in 52Ancestors, Primm, Rohleder, Severs. Bookmark the permalink.